I hope your week flew by quickly. 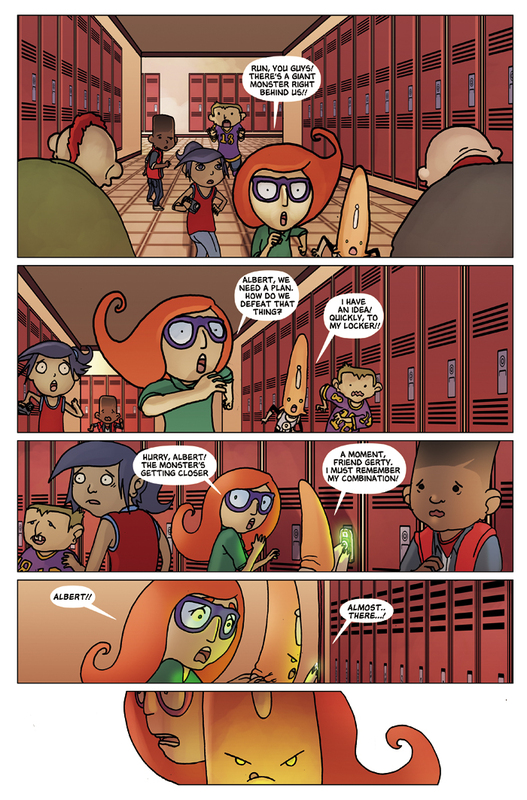 And speaking of quickly, the kids are running pretty fast in the latest Albert the Alien update! Recall from last week’s update that Albert and Gerty discovered Albert’s alien school supplies had built a giant Mecha School-Supply Monster out of our every day school supplies. And they wanted to take over the school! Now the kids need to find a way to defeat the monster and save their school. I don’t know about you, but this is a little more exciting than my average first day of school was growing up. But only just. Will the kids get into Albert’s locker safe and sound? How will the kids deal with this menace? Find out when we update Wednesday and Friday next week (and every week)! Please contact Trevor or Gabe by June 7 (that’s today!). These opportunities are first-come first-serve.